Held Sunday, May 15th, 2016 Mary kicked off the party and introduced our new WildChild. The fun and whimsical art of Bonnie Taylor-Talbot provided a "backdrop". Saeeda Wright's amazing soulful voice filled the room. Then guest speaker Karey Keith shared her thoughts about Hope. Sponsor Barb Mathey brought us more gorgeous goody bags, Yummy food, bubbly, Wild-tinis, and loads of Raffle items made for another fabulous gathering of Wild Women! Karey is a medium, healer, and teacher and who specializes in helping you empower your life with right choices. She has been a successful intuitive agent of change and healing since 1991. See your life from a well-rounded perspective. Relationships of all types can be enhanced, mended, and embraced as we find truth and understanding. Karey is trained in many modalities of Body Work and Coaching, including: Massage, Reiki, Reflexology, Cranial Sacral, Theta, Magnetic, Hypnotherapy, Herbal Body Wraps, and Holistic Psychology. ​Whether singing on a grand stage, speaking to an eager crowd, or authoring stories through lyric, melody, and beyond, Saeeda “Mama Sae” Wright is sure to elevate your mind and your spirit to heights you didn’t know you could reach. Her passion is electrifying, and her voice so magnetic you cannot help but find yourself enveloped in the stories Saeeda is telling. 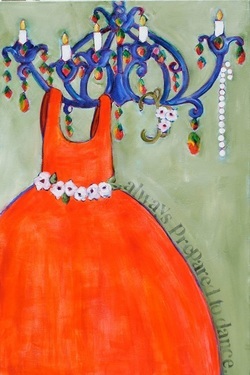 Her website says Whimsical, Joyful, & Delightful paintings…this describes the paintings AND the artist!